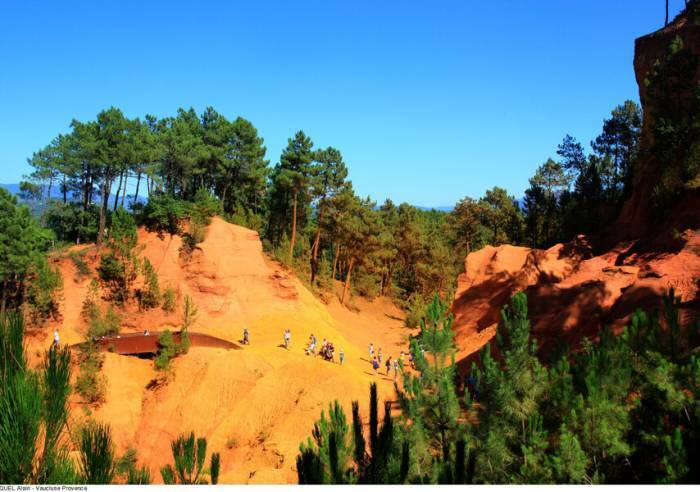 This is a trail which has been laid out in the former open-pit ochre quarries, where the cliffs are streaked with red and gold. Takes about 30 or 60 minutes depending on the trail you choose. A geological wonder. 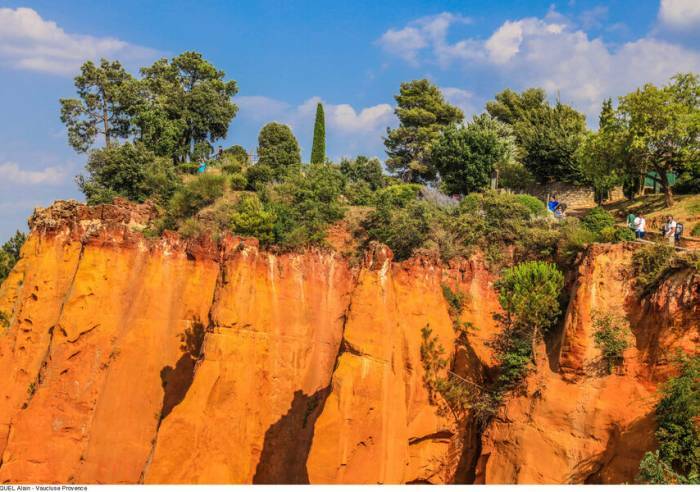 Ochre quarries and cliffs streaked with red and gold ochre sands have made Roussillon one of the most famous sites in the Luberon. Stroll amidst the ochre landscapes, follow the trail and learn from the explanatory signs which describe how the sands were formed and mined in the old ochre quarries. Visit on your own froml February to December. Combi-ticket with the visit of the Ochre Conservatory located slightly farther away, in the village. A great way to understand ochre from its extraction through to its processing and creation of products. Visit the former ochre factory with the basins, workshops, kilns ... shop and library. , Public WC, Car park, Pay car park, Parking, Coach parking, Pets welcome. Free entry for children < 10 years, mountain guides, the drivers, disabled people and accompanying persons. From 09/02 to 28/02, daily between 11 AM and 3.30 PM. From 01/03 to 31/03, daily between 10 AM and 5 PM. From 01/04 to 30/04, daily between 9.30 AM and 5.30 PM. From 01/05 to 31/05, daily between 9.30 AM and 6.30 PM. From 01/06 to 30/06, daily between 9 AM and 6.30 PM. From 01/10 to 31/10, daily between 10 AM and 5.30 PM. From 01/11 to 14/11, daily between 10 AM and 4.30 PM. From 15/11 to 05/01, daily between 11 AM and 3.30 PM.